This antibody fragment is derived from an abzyme, an antibody the possesses catalytic activity. In this case, the antibody catalyses ester hydrolysis. 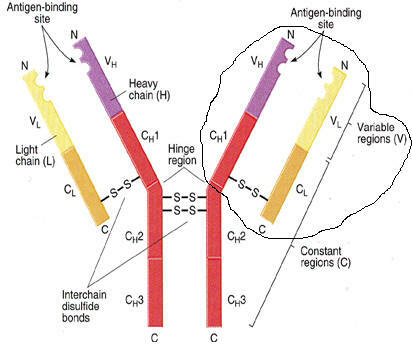 The protein on the left depicts one arm of an IgG antibody. Included are the variable light and heavy chains, and the constant light and constant 1 heavy chain. This can be seen in the circled portion of the figure below. Displays heavy chain in yellow and light chain in red. Disulfide bridges, found between two Cys amino acids, link the light chain with the heavy chain. Blue is the Heavy chain and Purple is the Light Chain. A hapten is a small molecule which can bind to an antibody but is incapable of inducing an immunogenic response unless the hapten is attached to a carrier protein. In this case, the hapten is a phosphonate, a noncleavable transition state analog. The protein amino acids that bind to the hapten.